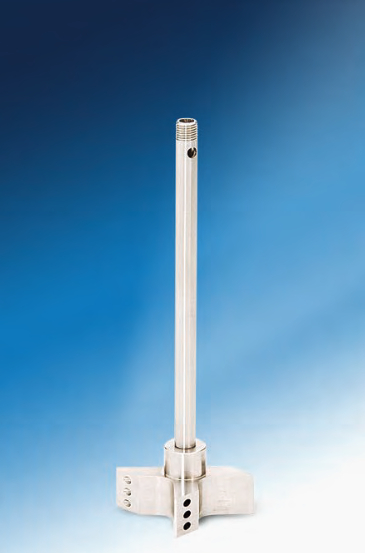 All stirrer options may not be appropriate or available for each reactor size. Additional internal fittings may be required to adapt some stirrer styles to existing reactors in the field. Please contact us for assistance in selecting a stirrer suitable for the intended operating volume and viscosity. The stirrer option shown always can be modified as your need for your General purpose reactor or Custom reactor. Turbine type impellers produce an excellent mixing action over the range of stirring speeds at which these reactors typically operate. These impellers are made in four-blade and six-blade styles, with the smaller four-blade impellers used only on Micro and Mini Reactors. These impellers, for reactors with 300 mL volume or greater, may be positioned anywhere on the stirring shaft, with one impeller usually located near the bottom of the vessel to keep solids up in suspension and a second impeller positioned near the base of the vortex to pull reactant gases down into the liquid phase. These impellers generally provide excellent mixing for systems with effective viscosities up to approximately 25,000 centipoise (cP) with a 16 in-lb magnetic drive or up to 50,000 cP with 60 in-lb magnetic drive. 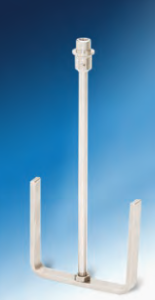 Anchor stirrers are available in several configurations for use with moderate to high viscosity materials. This type of stirrer usually works best in vessels with an inside depth to diameter ratio of 1.5 to 1 or less. They are intended to operate at relatively slow speeds and generally require a heavy duty drive system capable of generating and delivering sufficient torque to the agitator. Footless magnetic drives work well with anchor or spiral stirrers. 1. A U-shaped, flat bar anchor. 2. A flat blade, paddle type anchor. 3. A two-arm or three-arm, self centering anchor with PTFE wiper blades. Spiral stirrers are offered in two styles: stamped and machined. The standard spiral stirrer includes blades constructed of stamped sheet metal and provides a cost-effective option. The more robust machined spiral stirrer is manufactured from a solid piece of bar stock which results in added strength and facilitates cleaning. Either of these spiral stirrers can be installed in any 1 liter, 2 liter or 1 gallon reactor to produce a positive downward thrust or upward thrust action when working with viscous polymers or other high viscosity mixtures. They work best in floor stand reactors with adjustable speed and heavy duty drive systems. Either left-hand (downward thrust) or right hand (upward thrust) spirals are available. The downward thrust spiral is generally preferred for heavy suspensions. Parr offers a series of gas entrainment impellers for users who want to obtain maximum gas dispersion into a liquid system. This is obtained with a unique impeller attached to a hollow stirring shaft through which gases are continuously recirculated from the head space above the liquid through the impeller into the liquid phase. 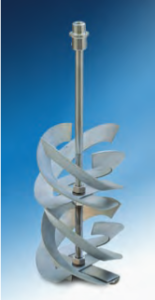 As with all impellers, the speed of the stirrer creates a vacuum at the tip of the impeller. Gas enters openings near the top of the shaft and is pulled through dispersion ports located at the tips of the impellers. In the Parr system with dispersion ports located at the very tips of the impellers, the higher the stirring speed — the higher the vacuum— and the higher the driving force for this very effective gas dispersion system. These impellers are offered as a complete package which includes the impeller, the hollow shaft with coupling, and any required foot bearings and brackets for the intended reaction. 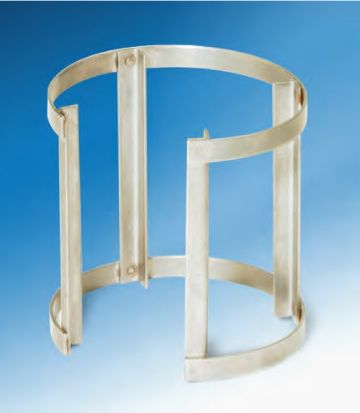 The baffles are a separate option which must be ordered individually.The gas entrainment stirrers may be ordered as an optional stirrer when purchasing a new reactor system or easily installed in an existing system in the field. With the wide variety of reactor head styles and magnetic stirrers furnished on Parr reactors it is best to contact us with the numbers stamped on the head of your vessel so that we will be able to furnish the correct gas entrainment assembly for a particular reactor system.